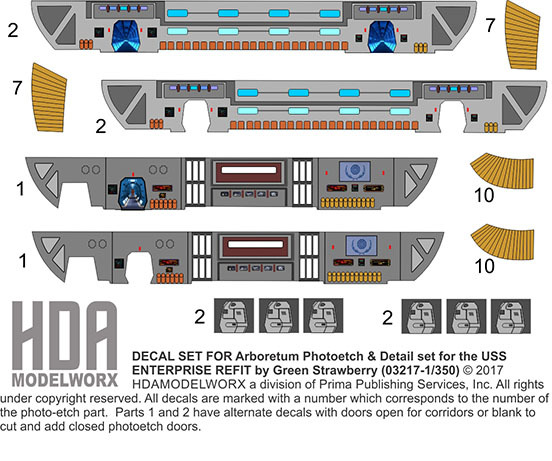 These decals have been developed with modeler Marc Fraley for his Moon Ship Diorama Build as seen on Scale Model Builder Enthusiasts on Google+. Designed to provide excellent detail to the arboretum photoetch walls without needing to try and paint the details yourself! Designed to fit the photoetch and gives you two options for the walls. One with corridors shown and another blank so you can use the photoetch doors to show them closed! We have even added decals for the doors if you want to show them closed so you don't have to paint those either! If you want detail without all the work then our newly developed decal set will allow you to add the detail without all the paint work! Just paint the brass photo etch white and add gloss coat and install the decals. Then seal them with your clear sealer. Instant detail without all the work! These decals are for the 1/350 Scale Polar Lights Refit U.S.S. ENTERPRISE NCC-1701/A model kit. This set comes with double decals for each part just incase you need an extra decal. Each decal is numbered to the corresponding photo etch part which makes identifying each part a snap! For Green Strawberry photoetch set #03217-1/350. Photoetch set is not included. Sold separately.